If you need chimney pipe or stove pipe and are not sure exactly what you need, enter your information below and one of our fireplace specialists will design your chimney installation for you. We will send you a quote via the email that you provide. Most installation designs and quotes will be sent within 1-2 business days. What Type of Appliance do You Need to Vent? Comments: Please select an option above. This will display a list of questions associated with that type of appliance. What is the inner diameter of pipe required? (Required) What is the brand and model of your appliance? Does your fireplace require double or triple wall pipe? Comments: Double wall pipe will suffice for most installations. If your chimney will be enclosed within the interior space of the house or if you install the piping within a well insulated chase on the exterior wall, double wall piping will be adequate. Triple wall pipe should be used for installations in an uninsulated chase or in an installation where the chimney will be exposed to the elements. Some units can use only double or triple wall pipe. We will substitute the proper series if the other is not available. Is Air Cooled Chimney Pipe or Solid Insulated Chimney Pipe needed? Comments: Depending upon the manufacturer of your appliance, you may be able to use air-cooled chimney pipe, insulated chimney pipe, or both. Air cooled chimney pipe uses an air space that circulates cool air from the outdoors to maintain safe operating temperatures. Insulated chimney pipe uses a refractory blanket of insulated material to keep the outer wall of the pipe cooler. You can find the information regarding what types are acceptable for use in your owner's manual for the appliance. If you are unable to determine what type of chimney pipe is needed, we can determine it for you - just mark "Unsure" as the answer to this question and we will build the quote with the proper pipe. If �Unsure� is selected and both types can be used with your unit, we will build the quote using the most cost effective type. Do you want full stainless pipe or galvanized/stainless pipe? Comments: Full stainless pipe offers greater durability, however galvanized/stainless pipe is more cost efficient. Not all fireplaces can use both types. We will substitute alternate piping, if a certain type is unavailable for your unit. What is the overall height from the floor to the flue collar on the installed appliance? Comments: The flue collar is the point on the unit where the first section of venting pipe attaches. What is the overall distance from the flue collar of the appliance to the ceiling? What is the overall distance from the floor to ceiling on second story (if applicable)? Comments: Please include the estimated thickness of the floor in your measurement. If you will not be venting through a second story, please put N/A as the answer to this question. What is the overall height from the attic floor to the roof decking? Comments: Please factor in the height of the ceiling joists with the measurement. Please supply your roof pitch. Measuring from the Top (see image below) - The measurements are taken from on top of the roof. Simply mark a level at 12", hold it perfectly level and measure from the roof surface to your 12" mark, this will give you the rise. Be careful with this method as a roof with many layers of shingles, or any type of roofing that is irregular can give you less than precise results. 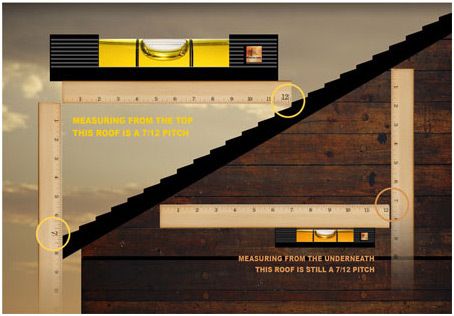 Measuring from the Bottom (see image below) - The measurements are taken from the bottom of the rafters, the procedure to calculate roof pitch is the same. This method tends to be more accurate because no layers of roofing are involved. To use this method there are 3 possible places to take your measurements. 1. The underside of a barge rafter on a gable end. 2. The underside of a rafter on a overhang at the bottom of the roof 3. The underside of a rafter in the attic. Because this roof has a rise of 7 inches when measured up from the 12 inch horizontal run, it is said to have a 7/12 pitch. Will an offset be needed to avoid any obstructions? -	Comments: Offsets are required if there are any obstructions within a 10 foot radius (horizontally) of the chimney pipe above the roof. Potential obstructions to chimney installation may include: A steeply pitched roof, a second story wall on a multi-tiered home, or a neighboring home. If you answered 'yes' to the last question, how many inches of offset are needed? - Comments: Offset may be required to avoid roofing rafters or joists. What is the total distance to the nearest obstruction from where the chimney will terminate above the roof? Comments: In order to determine distance to an obstruction, it will be necessary to stand at the point where the intended chimney pipe will penetrate the roof decking, measure 3 feet vertically from the roof decking, and measure horizontally in all directions from this 3 foot vertical point. If there are not any obstructions within a 10 foot radius, please put N/A as the answer to this question. What is the total distance to the ridge of the roof from the point where the chimney pipe will penetrate? Do you have any existing chimney or chimney pipe you plan to use? If you answered "Yes" to the above question, please provide a description of the chimney and/or chimney pipe you plan to use including brand, inside diameter, and number of walls. What is the diameter of venting pipe required? Comments: In order to determine the proper size needed, measure across the flue opening from side to side. This will determine what size piping you need. An alternate method would be to reference the owner's manual for the appliance. The manual will cover not only the size needed, but compatible brands of piping. If your stove uses an oval, oblong, or rectangular opening and you are unsure of the size of vent pipe needed, please select �Not Sure�. You will have the opportunity to provide dimensions of the opening later on. This will allow us to calculate the diameter of pipe needed for your stove to vent properly. Do you require double or single wall stove pipe? Comments: Stove pipe, also known as chimney connector, is the black piping located in the room with the appliance. Single wall stove pipe offers greater radiant heat into the room, but will stay warm/hot to the touch and is not as strong as other pipe. Double wall pipe is stronger and insulates better, but does not offer a radiant heat source. It will stay cooler than single wall. Double wall pipe is generally twice the cost of single wall pipe, due to the increased material used in construction. What is the shape of the vent opening on your stove? Comments: The vent opening on most modern stoves will be round, however some older models used an oval or rectangular opening. What are the dimensions of the vent opening on your stove? Is your appliance top venting or rear venting? Comments: Please factor the total height from the homes floor and include any additional height added by a hearth or any platform that the stove is mounted on. For rear venting stoves, measure from the floor to the center point of the flue collar. Do you plan on venting your appliance through the ceiling or a wall? What is the overall distance from the flue collar on the appliance to the ceiling? Comments: If you will not be venting through a second story, please put N/A as the answer to this question. Overall height from the attic floor to the roof decking. What is the overall distance from the back of the appliance to the wall that you will be venting through? What is the estimated thickness of the wall? What is the estimated vertical length of stove pipe needed before the pipe will be directed to the wall? Comments: Please note that a minimum of 12 inches of rise from the stove is recommended before a horizontal run begins. This will help ensure the stove will draft properly. What is the estimated length from the center point of the pipe that will protrude through the wall to the eave of the roof? What is the depth of your eave? -	Comments: Your appliance is a direct vent unit if it has a sealed glass window that is not able to be opened. B-vent units commonly use piping that is 3", 4", 5" or 6". B-vent units are open to the room and will only have a single collar for venting the unit. What is the overall height from the floor to the pipe outlet on the installed appliance? Comments: Please factor the total height from the homes floor and include any additional height added by a hearth or any platform that the stove is mounted on. Is your gas insert top venting or rear venting? Comments: If the insert is convertible between one and the other, please provide the venting option you plan on using. Comments: Please factor in the height of the ceiling joists in the measurement. Comments: Offsets are required if there are any obstructions within a 2 foot radius (horizontally) of the chimney pipe above the roof. Potential obstructions to chimney installation may include: A steeply pitched roof, a second story wall on a multi-tiered home, or a neighboring home. Comments: In order to determine distance to an obstruction, it will be necessary to stand at the point where the intended chimney pipe will penetrate the roof decking and measure horizontally in all directions from the penetration point. If there are not any obstructions within a 2 foot radius, please put N/A as the answer to this question. Do you have any existing chimney pipe or stove pipe you plan to use with this installation? If you answered Yes to the above question, please provide a description of the chimney and/or chimney pipe you plan to use including brand, inside diameter, and number of walls. Will the fireplace be at an angle to the wall or flat against it? What is the material on the outside of the wall that you plan on venting through? -	Comments: Common diameters of piping for direct vent gas stoves are 4" inner pipe by 6 5/8" outer pipe, 4" inner pipe by 7" outer pipe, and 5" inner pipe by 8" outer pipe. Your stove is a direct vent unit if it has a sealed glass window that is not able to be opened. B-vent units commonly use piping that is 3", 4", 5" or 6". B-vent units are open to the room and will only have a single collar for venting the unit. (Required) What is the brand and model of your stove? Is your stove a top venting or rear venting model? What is the overall distance from the top of the appliance to the ceiling? What is the distance from the center of the flue collar on the appliance to the wall you will be venting through? What is the overall thickness of the wall you will be venting through? What is the height difference between the center of the flue collar on the stove and the point on the wall that you plan on venting through? What is the shape of your venting outlet on your appliance? What are the dimensions/diameter of the flue collar on the appliance? Are you installing the insert into a prefabricated or masonry fireplace? What is the manufacturer name and model number of the fireplace? Comments: Manufacturers typically provide a build tag or plate that will be located on the left or right side of the fireplace opening, on the metal smoke shelf at the top of the opening, or in the open space beneath the floor of the fireplace. Measuring from the front of your fireplace, how far back is the center of the venting outlet inside the fireplace? What is the overall height of the existing chimney from the top of the prefabricated fireplace to the existing chimney cap? What is the inside diameter of the existing chimney connected to the prefabricated fireplace? Is the existing chimney on an inside or outside wall? What is the width and depth of the damper opening? What is the overall height of the chimney, measured from the hearth floor to the existing chimney cap? What is the shape of the existing masonry chimney liner? What are the dimensions or the diameter of the existing masonry chimney liner? -	Comments: Direct vent inserts use two small vent hoses for operation - they are usually 3" or 4" in diameter. Please advise if the hose outlets are the same or different sizes. Your appliance is a direct vent unit if it has a sealed glass window that is not able to be opened. B-vent units commonly use piping that is 3", 4", 5" or 6". B-vent units are open to the room and will only have a single collar for venting the unit. What is the diameter of the flue collars on your appliance? Are you installing the insert into a masonry or prefabricated fireplace? What are the dimensions or diameter of the chimney flue? What is the overall height of the chimney from the floor of the fireplace to the termination cap? ** If you have problems with the form submitting your inquiry, please email your information directly to chimneyquote@efireplacestore.com.